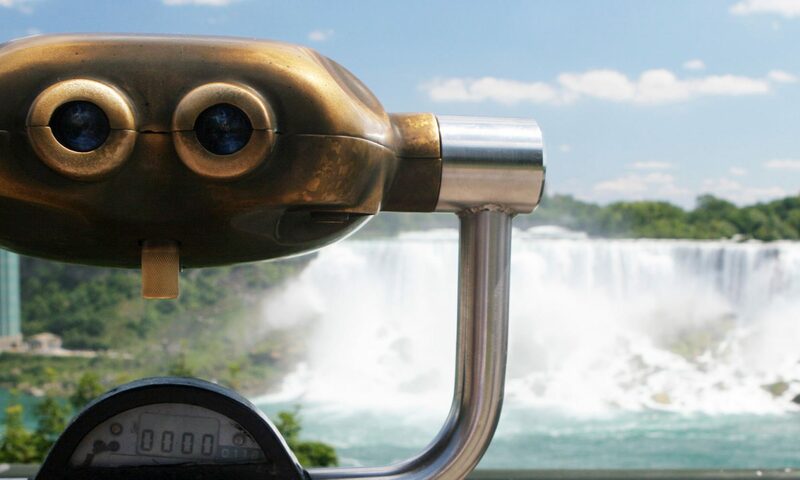 In 1827, Thomas Barnett began offering tourists a tour “Behind the Sheet” which included a walking tour to the base of the Horseshoe Falls and along a short ledge behind the falling water. In 1887, the Niagara Falls – Queen Victoria Park Commission decided that the circular staircase leading to the “Behind the Sheet” tour at the base of the Horseshoe Falls should be replaced with a hydraulic lift. The Fensom Elevator Works Company of Toronto was selected to install this lift for $7,300. The hydraulic lift could carry up to 10 people at a time on a 45 second journey to the base of the gorge. Water required for use of this hydraulic lift was piped in from the upper Niagara River. In the winter, the iron tower was enclosed in wooden shutters to prevent damaging ice accumulation. At the base of the elevator, a wide observation platform was built. During the spring of 1889, a major rock fall at the center of the Horseshoe Falls, diminished the flow of water over the Falls along the Canadian shore. With little water, the “Behind the Sheet” attraction as it was known was closed. On June 6th 1893, the Zybach and Brundage Company were granted an exclusive ten year lease to operate the hydraulic lift, the Under the Falls attraction and photography business at the Table Rock. In 1902, as part of the pipeline & powerhouse agreement, the Ontario Power Company agreed to build a 244 m tunnel behind the Horseshoe Falls. They were also required to construct an elevator to connect to this tunnel and provide free power for the elevator. In exchange the Ontario Power Company would take over the existing hydraulic lift to take its employees to and from their new power generating station at the base of the Falls. The initial tunnel was built by the Ontario Power Company. Workers bored through layers of differing rock and clays. It was 244 m long, 1.4 m wide and 2 m high. By 1903, the new elevator and tunnel had been completed and ready for the tourist season. By 1924, the Horseshoe Falls had receded to the point where the original portals had been built in 1903. As a result, a 55 m long extension was made to the tunnel extending under the Horseshoe Falls. In 1932, a commemorative plaque was erected to mark the site of the original Table Rock House which stood since being erected by Saul Davis in 1853. An inspection of the scenic tunnels revealed that gorge erosion had rendered the tunnels unsafe. The tunnel wall thickness had diminished to only 1.7 m between the tunnel and the gorge wall. A new tunnel was bored 18.3 m back from the former tunnel. The new tunnel was lined with concrete and electrically lighted. In 1951, an outdoor observation platform was built at the end of a branch of the old tunnel. The Table Rock House and the starting point for this tunnel trip was the oldest building in the park. Thus, the Parks Commissioners decided to build a modern Table Rock House, which was located only a short distance south of the old Table Rock structure. This new building would allowed a full view of the Horseshoe Falls. During 1916 as a result of WWI, the Table Rock House was closed and the military barricaded Queen Victoria Park from the Refectory to Dufferin Islands in order to protect the power generating stations. During the winter of 1916 – 1917, Table Rock House was used as headquarters for the Canadian Army. During this period, the Parks Commission was responsible to provide suitable accommodations for the troops. Bunk houses were built as were guard houses at the entrances to Queen Victoria Park. The military guard remained until the Spring of 1917. Construction of the new table Rock building began in September of 1925. The architectural firm Findlay & Foulis of Sault St. Marie designed the new Table Rock House. The location of the new building required the construction of a branch tunnel to connect to the main tunnel leading to the Horseshoe Falls. In 1925, the new building, which also served as a station for the electric railway, was completed. In 1939, with the beginning of WW2, the Canadian Army set up barbed-wire barricades around the power stations in Queen Victoria Park. In June of 1940, the Canadian Army again closed Queen Victoria Park from the Refectory to Dufferin Islands. The Table Rock and the Scenic Tunnels were closed to the public. Queen Victoria Park remained closed for nearly four years. On September 29th 1944, the military barricades were removed and Queen Victoria Park re-opened to the public. In 1963, extensive alterations were made to the Table Rock House. Again in 1989 a restoration project was started at table rock and completed in 1993. In 2007, Table Rock finished its renovations for the newest attraction, Niagara’s Fury.